Harriett has been a long-term supporter of the Tenbury Transport Trust and its volunteers and formally backed the bid for the new minibus. Harriett commented: “I have helped to support Tenbury Transport Trust for many years in any way I can and I was delighted when I was told that the bid for Government funding has been successful. “I want to formally thank all the many volunteers who help to transport people living in and around Tenbury. The service reaches some remote outlying villages with a lifeline. “We are blessed to live in a beautiful part of the country but sometimes rural areas miss out when it comes to public transport. Tenbury Transport Trust is a great organisation for helping people who need help the most." 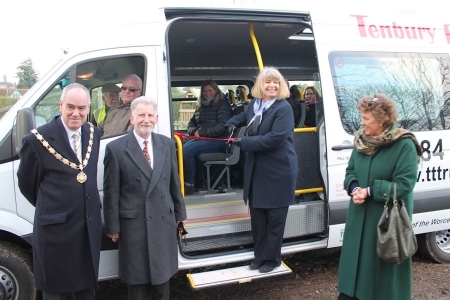 Photo: Harriett Baldwin MP unveils the new Tenbury Transport Trust minibus with Mayor Mark Willis and Trust chairman John Driver and manager Wendy Schuster.